Time for me to do some griping. It's been almost two months. That's too damn long. Here are some more pet peeves. Do people know how to count to 20? I'm serious. I can't tell you the number of times I've gone to the supermarket to just get a couple of things and have to wait and wait and wait. Why? Because the "only 20 items checkout" is packed with people with at least 200 items in each buggy. What the hell? That burns the hell out of me. 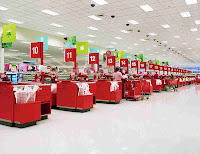 And, Mr. Supermarket Manager, why the hell do you only have 3 of these so-called "fast checkout lanes" out of the 25 other lanes? Turn signals. Once again...I can't understand why the hell it is so difficult for people to hit a turn signal so that the person BEHIND them will know they are about to TURN?!?!?! I got behind this...kid today, he is doing about 40MPH and all of sudden makes a right turn. Doesn't give a signal or anything. All I see are brake lights and hit the brakes. And, yes, I was four car lengths behind him. I still almost hit him. What is it with fast food restaurants and "apple pie?" It was bad enough they would say, "Can I add apple pie to your order" during lunch time at the drive through. Now, they are hawking the apple pie at breakfast!!! My retort (and I know they have to do it), "if I want any apple pie, I will ASK for it. Thank you." It's not their fault, I know. But, damn, it's getting crazy with the apple pie all the time! "You see what I'm saying?" Hearing someone say that is similar to someone raking their fingernails across a chalkboard to me. No, I DON'T see what you are saying. If I did, it would be because you are sending out smoke signals from your mouth. Even then, I don't read smoke signals. You read what I'm saying? EC droppers. For the love of God...put your EC widget at the TOP of your BLOG!!! Do you realize by placing it at the bottom of your blog most people are going to ignore it? You would be better served just taking the widget off completely if you have it at the bottom of your blog. At least, don't go below the "newspaper fold" of your blog. If I have to scroll past midway of your blog, I'm not going to drop my card on you. And there won't be any "smiles" either. Email. Please, please, please put a subject in your email. Like a lot of anti-virus programs, if my anti-virus program scans an email and does not see a subject line, it gets deleted. I've had two people ask "didn't you get my email?" Unfortunately, they did not put a subject line in the email. Links. I know people want to do link exchanges. I personally think it is overrated insofar as SEO. But, I simply can't accommodate everyone that asks me to do this. If you leave a link to your site in the chatbox, it is basically the same thing. It's not permanent. But, it does give you a backlink for a while. I think that chatbox will hold 250 messages. So, it takes a while for the messages to scroll off. People with the front page of their blog about the length of a football field. Why? Do you realize how long it takes for your page to load up? The attention span of the average surfer is about 8 seconds. If it takes longer than that, they're gone. So, all that trouble you went to posting that article on Christmas egg nog is going to go for nothing. This is something I learned very quickly. My front page was seven posts long. I went down to four posts. Then down to two posts. My front page still takes longer to load than I would like (I think it has a lot to do with poor programming). But, it's not nearly as bad as some sites I visit when I do an EC drop. At least consider shortening your front page. You'll make a lot of people happy. I hated when I worked at TJ Maxx - "Would you like to save 10% and sign up for a tjx rewards card?" Grrr! I hated having to ask EVERYONE about that. I felt so incredibly annoying. I think a lot of EC folks pages load slow because the pages are loaded with ads. That's all I see are ADS EVERYWHERE! It distracts from the content way too much. hello.. thanks sir for visiting my blog..
Jennifer, I hear that every time I go to the supermarket. I tell them I have no interest in their 'savings card," but I realize they are forced to ask. I feel sorry for them. I used to look for the EC cards. If they are below the fold, as I stated in my entry, I refuse to drop on them. I am not going to look for their widget. Thanks for the comment. Mishuk, the only think I can tell you is to look up SEO blog in google or whatever your favorite search engine might be. I'm sorry, but I'm probably the last person you need to ask this question. jaed, thanks for coming by.